The hand is the distal functional tool of the upper limb an important organ for day-to-day functions. It is designed for grasping, for precise movements and serving as a tactile organ. Hand anatomy is complex and intricate. This enables hands to do gross as well as precise functions. A total of 27 bones constitute the basic skeleton of the wrist and hand [8 carpals, 5 metacarpals, 14 phalanges (3 for each digit except thumb which has 2]. The hand is innervated by the median, ulnar, and radial nerves — each of which has sensory and motor components. The muscles of the hand are divided into intrinsic and extrinsic groups. The skin of the dorsum of the hand is thin and attached to the hand’s skeleton only by loose areolar tissue which also harbors veins and lymphatics. This arrangement is responsible for large swelling seen often in the dorsal aspect of the hand. Palmar skin is thick for protection of underlying tissues, immobile because of its firm attachment to the underlying palmar aponeurosis by vertical fibers and creased. All these factors increase the efficiency of grip. Palmar skin is firmly anchored to the deep structures at the palmar creases. The blood supply to the palmar skin is through numerous small, vertical branches from the common digital vessels. Therefore, the elevation of palmar skin flaps is limited. The wrist is formed by 8 carpal bones grouped in 2 rows. From radial to ulnar, the proximal row consists of the scaphoid, lunate, triquetrum, and pisiform bones and the distal row consists of the trapezium, trapezoid, capitate, and hamate bones. The pisiform is a sesamoid bone in the flexor carpi ulnaris tendon. The metacarpals are 5 bones that connect wrist to phalanges. Metacarpals are numbered from lateral to medial side. Each metacarpal consists of a distal head, a shaft and a base at the proximal end. The head is rounded. Knuckles represent the head of metacarpal bones. It has an articular surface which extends more anteroposteriorly than laterally. It extends more on the palmar surface than on the distal surface. The shaft is concave on the palmar surface and convex dorsally. Its dorsal surface bears a flat triangular area in its distal part. The base is irregularly expanded. First metacarpal is the shortest and stoutest of all metacarpals. It bears concavoconvex articular surface for the trapezium. The shaft is convex dorsally. The ulnar and radial corners of the palmar surface show impressions for sesamoid bones. Movements of thumb occur at right angles to other digits as first metacarpal bone is rotated through 90 degrees relative to the other metacarpals. First metacarpal is unique in that it does not articulate with any other metacarpal bone. First metacarpal articulates with the trapezium. The opponens pollicis is inserted on the radial border and the anterolateral surface of the shaft. The abductor policis longus is inserted on the lateral side of the base. The first palmar interosseus muscle arises from the ulnar side of the base. The base of the second metacarpal is grooved from before backwards. The medial edge of the groove on the base is deeper than the lateral edge. The medial side of the base bears an articular strip. The second metacarpal articulates with the trapezium, the trapezoid, the capitate, and third metacarpal. Flexor carpi radialis is inserted on a tubercle on the palmar surface if the base. Extensor carpi radialis longus is inserted on the dorsal surface of the base. Oblique head of the adductor pollicis arises from the palmar surface of the base. The base of the third metacarpal has a styloid process projecting up from the dorsolateral corner. The lateral side of the base bears an articular strip for the second metacarpal and medial side has two small oval facets for the fourth metacarpal. The third metacarpal articulates with capitate, second metacarpal, and fourth metacarpal. A slip from the flexor carpi radialis is inserted on the palmar surface of the base. The extensor carpi radialis brevis is inserted on the dorsal surface of the base, immediately beyond the styloid process. The oblique head of the adductor pollicis arises from the palmar surface of the base. The transverse head of the adductor pollicis arises from the distal two-third of palmar margin of the shaft. Base of fourth metacarpal possesses two small oval facets on its lateral side for the third metacarpal, and on its medial side ii has a single elongated facet for the fifth metacarpal. It articulates with the capitate, the hamate, and the third and fifth metacarpals. The base of the fifth metacarpal has an elongated articular strip on its lateral side for the fourth metacarpal. The medial side of the base is nonarticular and bears a tubercle. The fifth metacarpal articulates with the hamate and the fourth metacarpal. The extensor carpi ulnaris is inserted on the tubercle at the base. The opponens digiti minimi is inserted on the medial surface of the shaft. Primary center for shaft appears in the ninth week of development. Secondary center for the head appears in the second to fifth metacarpals and for the base in the first metacarpal 2nd year and fuses with the shaft at about 16—18 years. 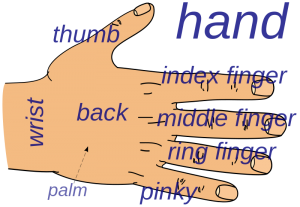 There are 14 phalanges in each hand, 3 for each finger and 2 for the thumb. Each phalanx has a base, a shaft, and a head. In a proximal phalanx, the base is marked by a concave oval facet for articulation with the head of the metacarpal bone. In a middle phalanx or a distal phalanx, it is marked by two small concave facets separated by a smooth ridge. It tapers towards the head. The dorsal surface is convex from side to side. The palmar surface is flattened from side to side but is gently concave in its long axis. In the proximal and middle phalanges, the head has a pulley-shaped articular surface. In the distal phalanges, the head is nonarticular and is marked anteriorly by a rough horse-shoe-shaped tuberosity which supports the sensitive pulp of the fingertip. There are five proximal phalanges which correspond to each of the five fingers. Proximal phalanges have a proximal base with a transverse oval articular facet which connects them to their respective metacarpal bones. The shafts are convex dorsally and flat on their palmar aspect. Sharp medial and lateral borders provide attachment to fibrous tendon sheaths of the flexor muscles. Distal articular surface or trochlea forms joint with middle phalanx and in the case of the thumb, to its distal phalanx. The proximal phalanx provides attachment to fibrous flexor sheath is attached to the sides of the shaft. On each side of the base, parts of the lumbricals and interossei are inserted. In the thumb, the proximal phalanx provides attachments to the following structures. Adductor pollicis and the first palmar interosseus on the medial side. Extensor pollicis brevis on the dorsal surface. In the little finger, the medial side of the base of the proximal phalanx provides insertion to the abductor digit minimi and the flexor digit minimi. Thumb has got no middle phalanx, all other fingers have. Middle phalanges have a proximal base and a distal head which is separated by a much shorter shaft than that of the proximal phalanges. The proximal articular surface is shaped corresponding to the distal head of the proximal phalanx. The heads of the middle phalanges articulate with the bases of the distal phalanges to form the distal interphalangeal joint. The middle phalanx gives attachment to flexor digitorum superficialis is inserted on each side of the shaft. The fibrous flexor sheath is also attached to the side of the shaft. A part of the extensor digitorum is inserted on the dorsal surface of the base. There are five distal phalanges. Each of these phalanges is tapered distally to end in a rough surface. The base is wider and its articular surface forms a distal interphalangeal joint. The flexor digitorum profundus inserted on the palmar surface of distal phalanges. In case of thumb, the place is taken by flexor pollicis longus. Primary center for shaft of each phalanx appears during the eighth week of development in the distal phalanx, 10th week in the proximal phalanx and 12th week in the middle phalanx. The secondary center appears for the base between 2-4 years and fuses with the shaft during 15-18 years. The proximal row of wrist bones articulates with the radius and ulna to provide extension, flexion, ulnar deviation, and radial deviation. The is supported by palmar ligaments and dorsal ligaments. This joint is supported by an extrinsic set of strong palmar ligaments that arise from the radius and ulna. Dorsally, it is supported by the dorsal intercarpal ligament between the scaphoid and triquetrum and by the dorsal radiocarpal ligament. Individual motion between carpal bones is restricted. Intercarpal ligaments are the strong ligaments that hold carpal bones together. Scapholunate ligament and the lunotriquetral ligament are important intercarpal ligaments and disruption of either one can result in wrist instability. Metacarpophalangeal joints are formed between the head of metacarpals and the articular surface of the base of the proximal phalanx. The arrangement of these ligaments is such that these ligaments are tight when the joint is flexed and loose when extended. On volar aspect, these joints [and interphalangeal joints part of capsule forms the volar plate. It is also called, palmar plate or palmar plate. Volar plate reinforces the joint capsules, enhance joint stability, and limit hyperextension. Volar plates at the metacarpophalangeal and interphalangeal joint are similar in structure and function except that in the metacarpophalangeal joints they are interconnected by a deep transverse ligament. Structurally, volar plate is fibrocartilaginous structure is attached to distal to the joint. It forms a palmar continuation of the articular surface phalanx and adds to the articular surface during extension. Volar plate becomes membranous at the proximal end and blends with the volar part of the joint capsule which is attached to the head of the metacarpal bone. The volar plate is able to function to resist tensile stresses, restrict hyperextension and protects the volar articular surface. Thumb metacarpophalangeal joint has a transverse longitudinal rectangular shape. Four volar plates of the fingers interconnected by the deep transverse metacarpal ligament and dorsal to this ligament on each side of the metacarpal heads are sagittal bands that connect the volar plates to the tendon of the extensor digitorum and to the extensor expansion. These bands help stabilize the volar plates over the metacarpal heads. The volar plate of the thumb metacarpophalangeal joint is a thick structure firmly attached to the base of the proximal phalanx. The volar plate is part of the joint capsule that attaches only to the proximal phalanx, allowing hyperextension. The volar plate is also the site of insertion for the intermetacarpal ligaments which restrict the separation of the metacarpal heads. Dorsal surfaces of metacarpophalangeal joints are covered by the expansions of the extensor tendons, together with some loose areolar tissue. The movements which occur in these joints are flexion, extension, adduction, abduction, and circumduction though the movements of abduction and adduction are very limited. The joints between phalanges of the fingers called interphalangeal joints of the hand. These are hinge joints. Anatomically, the proximal and distal interphalangeal joints are very similar. Transverse diameter is greater than its anteroposterior diameter, especially at the proximal interphalangeal joint. PIP joint has thick and its thick collateral ligaments. The capsule, extensor tendon, and skin are very thin and lax dorsally, allowing for both phalanx bones to flex more. At the level of the PIP joint, the extensor mechanism splits into three bands as discussed in extensor aponeurosis. A thick ligament on the palmar side prevents hyperextension. The distal part of the volar ligament, is the volar plate, a fibrocartilaginous structure similar to the metacarpophalangeal joint. The palmar plate forms a semi-rigid floor and the collateral ligaments the walls in a mobile box which moves together with the distal part of the joint and provides stability to the joint during its entire range of motion. Movements permitted in the interphalangeal joints are flexion and extension. Flexion is about 100° and about 80°, in the distal interphalangeal joints. Extension is limited by the volar and collateral ligaments. After the skin, there is superficial fascia of the palm, made up of dense fibrous bands which bind the skin to the deep fascia and divide the subcutaneous fat into small tight compartments which serve as water-cushions during firm gripping. The transverse fibers are concentrated in the mid palm and web spaces. They are closely associated with the longitudinal fibers and serve as pulleys for the flexor tendons proximal to the digital pulleys. The vertical fibers of the palmar fascia attach to the dermis of the palmar skin. Deep to the longitudinal and transverse fibers, the vertical fibers coalesce into septa and attach to the metacarpals, forming 8 different compartments for the flexor tendons and neurovascular bundles of each digit. The fascia contains a subcutaneous muscle the palmaris brevis. Palmaris brevis improves the grip by steadying the skin on the ulnar side of the hand. The superficial metacarpal ligament is a part of this fascia. Superficial metacarpal ligament stretches across the roots of the fingers over the digital vessels and nerves. Fibrous flexor sheaths in the fingers. These three structures form a continuous structure which holds tendons in position and thus increases the efficiency of the grip. Flexor retinaculum is a strong fibrous band which bridges the anterior concavity of the carpus and converts it into a tunnel, the carpal flexor tunnel. It is medially attached to pisiform bone and hook of the hamate. Laterally, it joins tubercle of the scaphoid and the crest of the trapezium. On either side the retinaculum has a slip. The lateral deep slip is attached to the medial lip of the groove on the trapezium which is thus converted into a tunnel for the tendon of the flexor carpi radialis. The medial superficial slip is attached to the pisiform bone. The ulnar vessels and nerves pass deep to this slip. 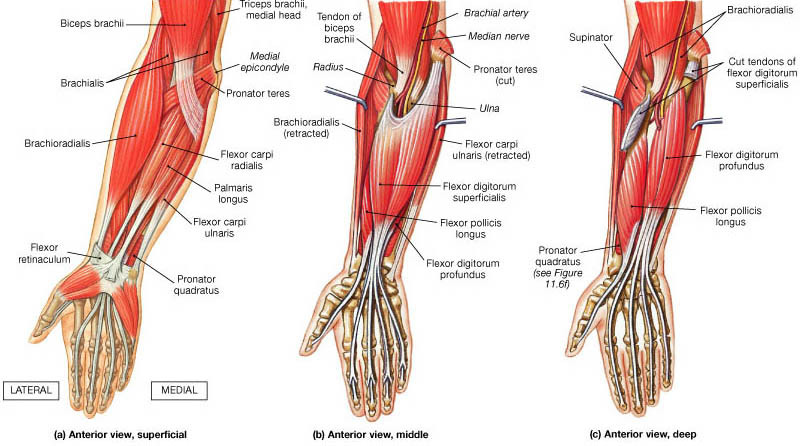 Thenar and hypothenar muscles have their origins from flexor retinaculum. The tendon of the flexor carpi radialis lies between the retinaculum and its deep slip, in the groove on the trapezium. This represents a central part of the deep fascia of the palm though the term is often used for deep fascia of the palm as well. It covers the superficial palmar arch the long flexor tendons, the terminal part of the median nerve and the superficial branch of the ulnar nerve. Palmar aponeurosis is triangular with its apex proximal. The apex blends with the flexor retinaculum and is continuous with the tendon of the Palmaris longus. The base is directed distally. Phylogenetically, the palmar aponeurosis represents the degenerated tendon of the Palmaris longus. Extensions of the aponeurosis pass to the deep transverse metacarpal ligament and its capsule, the capsule of the metacarpophalangeal joints and the sides of the base of the proximal phalanx. The digital vessels and nerves, and the tendons of the lumbricals emerge through the intervals between the slip. From the lateral and medial margins of the palmar aponeurosis, the lateral and medial palmar septa pass backwards and divide the palm into compartments. Palmar aponeurosis fixes the skin of the palm and thus improves the grip. It also protects the underlying tendons, vessels, and nerves. The fibrous flexor sheaths are formed up of the deep fascia of the finger. It is attached to the side of the phalanges and across the base of the distal phalanx. Proximally, the end is open it is continuous with a slip of the palmar aponeurosis. In this way, a blind osteofascial tunnel is formed which contains the long flexor tendon enclosed in the digital synovial sheath. The fibrous sheath is thick opposite the phalanges and thin opposite the joints to permit free flexion. The sheath holds the tendons in position during flexion on the digits. Each of the fingers contains 5 annular pulleys and 4 cruciate pulleys. The thumb has 2 annular pulleys and 1 oblique pulley. Second and fourth annular pulleys in fingers and the oblique pulley is the critical pulley in the thumb. Deficiency of the pulley system can result in less active flexion of the digit for a certain tendon excursion. The deep fascia on the neck of the wrist is thickened to form the extensor retinaculum. It is about 2cm broad oblique band directed downwards and medially and holds the extensor tendons in place. The extensor retinaculum is attached to the lower part of the anterior border of the radius laterally. On the medial side, it is attached to the styloid process of the ulna, the triquetral, and the pisiform bones. The retinaculum sends down septa which are attached to the longitudinal ridges on the posterior surface of the lower end of the radius. This creates six osteofascial compartments on the back of the wrist. Following structures pass through each compartment, from the lateral to the medial side. Each compartment is lined by a synovial sheath which is reflected on the contained tendons. Spaces of hand are formed by fascia and fascial septae. Fascia and fascial septae of the hand are arranged in such a manner that many spaces are formed. These spaces are important as they can get infected and distended with pus. The hand is innervated by three nerves: the median, ulnar, and radial. The median nerve supplies the muscles involved in fine precision and the pinch function. Palmar cutaneous branch is given off proximal to the wrist, and supplies area over the thenar eminence. The median nerve palm by passing deep to the flexor retinaculum. It lies front of the ulnar bursa enclosing the flexor tendons. Below the retinaculum, the nerve divides into lateral and medial division. Its recurrent motor branch innervates the thenar muscles [abductor pollicis brevis, opponens pollicis, and superficial head of flexor pollicis brevis]. Three digital branches supply the lateral three and a half digits including the thumb. The digital branch to the index finger also innervates the index and long finger lumbrical muscles. The medial division divides into two digital branches for the second and third interdigital clefts supplying the adjoining side of the index, middle and ring fingers. The lateral common digital branch also supplies the second lumbrical. Palmar skin over the middle and distal phalanges of the lateral three and a half digits. Ulnar nerve [C8-T1] is the main nerve of the hand. It enters the palm by passing superficial to the flexor retinaculum between pisiform bone and the ulnar vessels. Here, the nerve divides into the superficial and deep terminal branches. The superficial terminal branch supplies the palmaris brevis and divides into digital branches for the medial one and half fingers. It travels between the opponens digit minimi and the fifth metacarpal bone, lying in the hook of the hamate. Finally, it turns laterally within the concavity of the deep palmar arch and supplies abductor pollicis muscles. Two palmar digital sensory branches for the medial one and half finger. The medial branch supplies the medial side of the little finger. The lateral branch is called common palmar digital nerve: it divides into two proper palmar digital nerves for the adjoining sides of the ring and little finger. 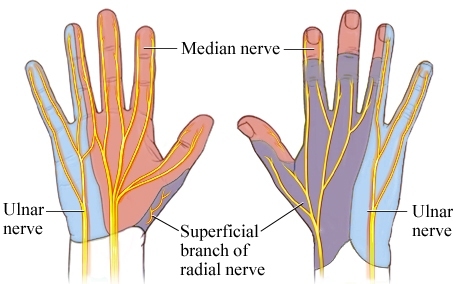 The common palmar digital nerve communicates with the median nerve. The part of redial nerve seen in the hand is a continuation of the superficial terminal branch. It reaches the dorsum of the hand and divides into 4 or 5 dorsal digital branches which supply the skin of the digits as follows. The radial nerve is responsible for innervating the wrist extensors also. Second branch for medial side of thumb. Third branch for lateral side of index finger. Fourth branch for contiguous side of index and middle fingers. Fifth branch when present it supplies the contiguous sides of the middle and ring fingers. Note that skin over the dorsum of the distal phalanges and part of the middle phalanges is supplied by the median nerve. See the following diagram. The muscles of the hand are divided into extrinsic and intrinsic groups. The intrinsic muscles are located within the hand itself, whereas the extrinsic muscles origin proximally in the forearm and insert into the hand. The extensor muscles are all extrinsic, except for the interosseous-lumbrical complex, which is involved in interphalangeal joint extension. All of the extrinsic extensor muscles are innervated by the radial nerve. The extensor muscles of the wrist are extensor carpi radialis brevis, extensor carpi radialis longus and extensor carpi ulnaris. Extensor digitorum communis is the main extensor of fingers. Index and little fingers have their own extensors in addition to this, namely extensor indicis proprius[index finger], and extensor digiti minimi [little finger]. They insert to the base of the middle phalanges as central slips and to the base of the distal phalanges as lateral bands. The abductor pollicis longus, extensor pollicis brevis, and extensor pollicis longus extend the thumb. They insert at the base of the thumb metacarpal, proximal phalanx, and distal phalanx, respectively. The extrinsic flexors consist of three wrist flexors, thumb and finger flexors. All the extrinsic muscles are innervated by the median nerve, except for the flexor carpi ulnaris and the flexor digitorum profundus to the small and ring finger, which are innervated by the ulnar nerve. Flexor pollicis longus is the extrinsic thumb flexor which inserts at the thumb distal phalanx. Flexor digitorum superficialis and flexor digitorum profundus are the extrinsic flexor muscles of the hand. The intrinsic muscles are situated totally within the hand. They are divided into four groups – the thenar, hypothenar, lumbrical, and interossei muscles. Hand has a rich vascular network contributed by radial and ulnar arteries. It reaches the proximal end of the first interosseous space and passes between the two heads of the first dorsal interosseus muscle to reach the palm. In the palm, the radial artery runs medially. At first it deep to the oblique head of the adductor pollicis, and then passes between the two heads of this muscle and known as the deep palmar arch. On the dorsum of the hand, the radial artery gives off a branch to the lateral side of the dorsum of the thumb and first dorsal metacarpal artery. First dorsal metacarpal artery arises just before the radial artery passes into the interval between the two heads of the first dorsal interosseous muscle. It at once divides into two branches for the adjacent sides of the thumb and the index finger. In the palm, the radial artery gives off princeps pollicis artery and radialis indicis artery. Princeps pollicis artery divides at the base of the proximal phalanx into two branches for the palmar surface of the thumb. The radialis indicis artery descends between the first dorsal interosseous muscle and the transverse head of the adductor pollicis and supplies the lateral side of the index finger. It anastomoses with the princeps pollicis artery and gives a communicating branch to the superficial palmar arch. Sometimes, The radialis indicis artery may arise from the princeps pollicis. Sometimes the princeps pollicis and the radialis indicis arteries arise by a common trunk called the first palmar metacarpal artery. The ulnar artery runs distally in the forearm under the flexor carpi ulnaris muscle. At the wrist, it travels into the hand through the Guyon canal superficial to the flexor retinaculum. It divides into the superficial palmar branch and the deep palmar branch. These branches take part in the formation of the superficial and deep palmar arches respectively. Arches of the hand are formed by anastomoses of the branches of the terminal parts of the ulna and radial arteries. The superficial palmar arch is formed as the direct continuation of the ulnar artery beyond the flexor retinaculum. The superficial palmar arch lies directly deep to the palmar fascia, palmaris brevis, and the palmar aponeurosis. It crosses the palm over the flexor digiti minimi, the flexor tendons of the fingers, the lumbricals, and the digital branches of the median nerve. On the lateral side, superficial palmar branch of the radial artery, radialis indicis, and the princeps pollicis. Superficial palmar arch gives rise to the volar common digital arteries and multiple branches to intrinsic muscles and skin. Distal in the palm, the common digital arteries bifurcate into the proper digital arteries. It is interesting to note that in the palm, the arteries lie volar to the corresponding nerves but the relation is reversed in the digits. The deep palmar arch is formed mainly by the terminal part of the radial artery and is completed medially by the deep ulnar branch of the ulnar artery. Deep to long tendons, the arch lies on the proximal parts of the shafts the metacarpals, and on the interossei. It lies under cover of the oblique head of the adductor pollicis, the flexor tendons of the fingers, and the lumbricals. The deep branch of the ulnar nerve lies within the concavity of the arch. Three metacarpal arteries, which run distally in the second, third and fourth spaces supply the medial four metacarpals, and terminate at the finger clefts by joining the common digital branches of the superficial palmar. Dorsally, the arch gives off three perforating arteries which pass through the medial three interosseous spaces to anastomose with the dorsal metacarpal arteries. The distal perforating arteries connect the palmar digital branches of the superficial palmar arch with dorsal metacarpal arteries. Recurrent branches pass proximally to supply the carpal bones and joints and end in the palmar carpal arch. Veins generally follow the deep arterial system as venae comitantes. A superficial venous system also exists at the dorsum of the hand. Many of the tendons entering the hand are surrounded by synovial sheaths. The synovial sheaths of the index finger, middle finger and ring finger are independent and terminate proximally at the levels of the heads of the metacarpals. Synovial sheath of the little finger is continuous with the ulnar bursa and that of thumb with radial bursa. [Infections of the little finger and thumb can spread into the palm and even up radial and ulnar the wrist]. Half of the times, the radial and ulnar bursa communicate with each other behind the flexor retinaculum. The nails are specialized skin appendages derived from the epidermis that are present in terminal dorsal part of the distal phalanx. The entire nail matrix is in intimate contact with the periosteum of the distal phalanx; therefore, it is vulnerable to injury when the latter is fractured.